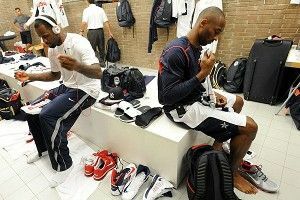 Show of hands: Who here is surprised that Kobe Bryant takes IMMENSE CARE in folding his socks? This could have something to do with the relatively cold surroundings (like … brickwork? Is there an Apartment Therapy for locker rooms? ), but I’m not getting Butch-and-Sundance vibes from these two.